← My first book…buy yours NOW! Hi Monica, Great post! Now why didn’t I think of using fruit for a kvass? My kids are NOT drinking beet kvass, will not eat saurkraut, nor dilly fermented carrots. But this, I am fairly certain they will love (anything with berries). I can’t wait to try it! awesome! I’ve been doing the beet kvaas the same way! Sounds delightful! I’ll be putting up some ketchup myself today…and more kraut! Got to keep those good bugs coming! This is really tasty! Can I make a second batch of kvass with the same fruit by just adding more water when there is just a bit of liquid left? If so, should I also add more whey? It is best to add water every time you drink some. Then put back in the refrigerator. Toss the fruit when it is spent. Enjoy! 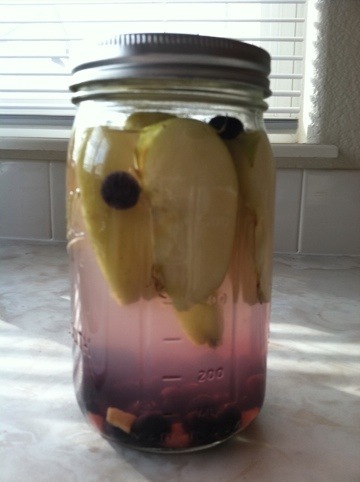 this fruit kvass is a huge hit. my husband won it at the cooking class in Groton. We’ve been making every since 🙂 So great. So, do the apples begin to break down and get brown in the mix after it is in the fridge, or does this mean that it didn’t ferment enough to preserve them? Tastes wonderful and my daughter loves it, just want to make sure its good. btw, we meet at the four fold conference! Wonderful cooking class! Love this recipe. I didn’t know kvass even existed until today. I would love to try this recipe but was wondering if there was an alternative to whey? I do make my own kefir so it’s not a prob, but I heard you could use unpasturised honey or yeast instead? You could use kefir whey instead of yogurt whey, or you could skip the whey altogether and add a culture (starter pack). Honey or yeast are not advised.